Liverpool players could quite reasonably claim to have had two decent shouts for a penalty turned down in quick succession against Manchester United today. 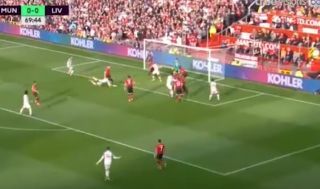 Watch the incidents below as two Liverpool corners led to claims of fouls by Scott McTominay on Georginio Wijnaldum and then one on Joel Matip. In fairness, it’s not clear there’s really enough in either of them to warrant a penalty, but Liverpool did not look happy and could argue that by the letter of the law, there was a case for at least one of those to be given.